Agency Power produces high performance radiator parts for vehicles. This includes high grade silicone radiator hoses to improve flow, longevity, and add style to your engine bay. The amount of heat a performance motor puts out is far greater then most standard designed engines. For high performance needs, keeping a cars engine temperatures down and efficient is EXTREMELY important. 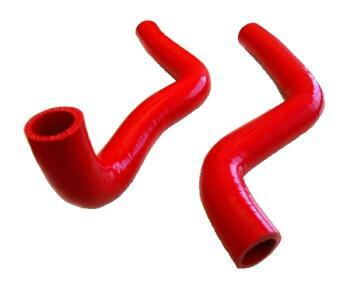 Agency Power now offers this 5 ply silicone radiator hose kit for your Vehicle. These hoses replace your factory hoses. The OEM rubber hose tends to burst under extreme heat and crack over time. These silicone hoses improve flow and are not affected by heat like rubber hoses. They come in 3 powerful colors. Glossy black, red, or blue are available. Each hose kit includes new clamps for easy installation.